Laminate is a practical, stylish and generally a less expensive alternative to real wood and tile floors. Laminate is fitted as a floating floor, meaning you avoid the complications and costly drawbacks associated with the fitting of a real wood floor. We have a designated section in our showroom displaying the various manufacturers and suppliers of laminate floors to suit all tastes and budgets. With 100’s of different colours, textures and designs you can choose a flooring to suit your decor. Dirt or dust sits on the surface so can be cleaned with ease. Any spillages can be simply mopped up. Laminate flooring is extremely tough. It is scratch, shock and impact resistant. It will not warp like real wood can. 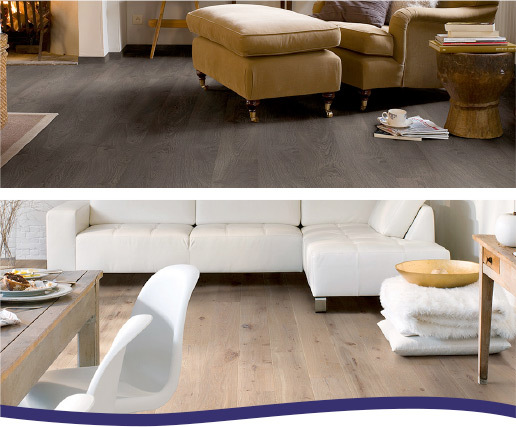 The fantastic click system enables the DIY enthusiast to install laminate flooring themselves.